Thursday......actually this is technically the last "summer" Thursday for our second oldest son. Our oldest started High School over two weeks ago. Our second oldest is out on a movie play date with our neighbors and my girls......are actually.......SLEEPING!! I don't want to type that word to loud in case I jinx it. It has been filled with our oldest's baseball games and practices, our second oldest's birthday, Tae Kwon Do as well as his advancing up a belt in Tae Kwon Do as well. We've gone to the park, we taken a trip to the lake, and thrown two family vacations into one as well. I think we have done well this summer. Saying that, summer is not over yet and I felt the need to create a cocktail that proves that. For a few weeks now this little bottle of pink lemonade has been staring me down each and every time I open up that darn fridge. Today.......I decided to put it into use. I wanted to create a delicious, yet easy cocktail to make and enjoy on a warm summer day. I am enjoying this one......a little too much. 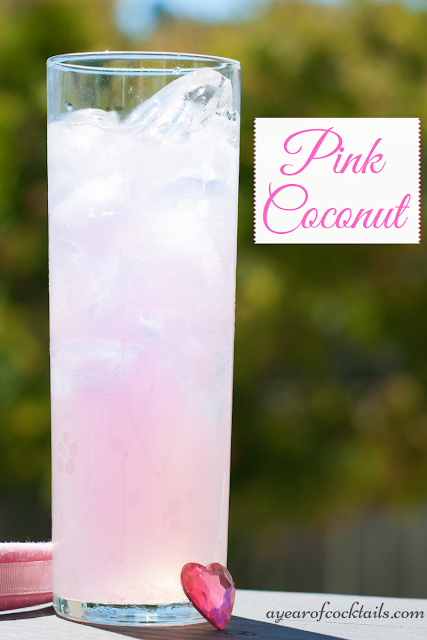 The coconut and pink lemonade flavors together create magic in your glass! In a tall cocktail glass filled 3/4 with ice, pour in the two ingredients above. Give you cocktail a good stir and enjoy! Here's to beautiful August days. Sometimes it is just that simple, I agree! I wonder how much difference there is between pink and yellow lemonade. Pink is sweeter, isn't it? I had some yellow lemonade, so I tried this, and thought it a little odd. Not bad, but odd. Perhaps I just wasn't in the mood for it. I think there is a little difference, and my pink lemonade has raspberry flavor in it too (just realized that), so that's what probably made a bigger difference, lol.